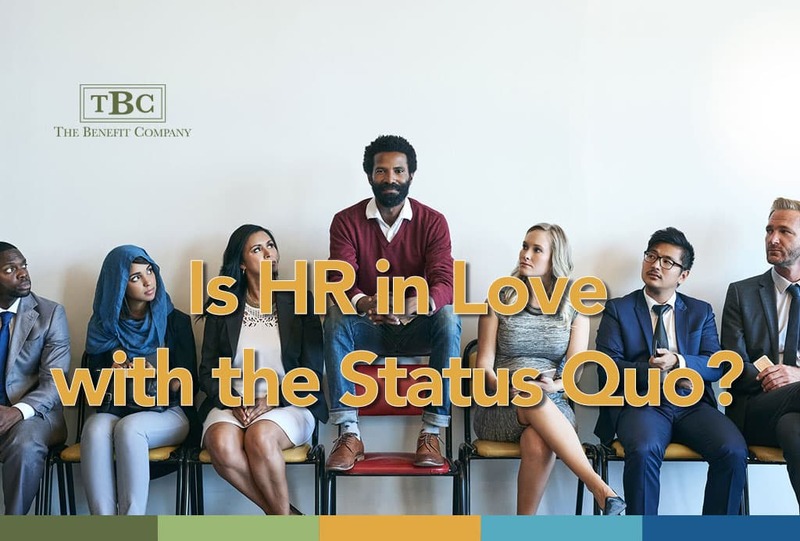 Is HR in Love with the Status Quo? As a credentialed HR professional, I take note of any sweeping statement attempting to put us in pigeonholes — particularly if they lump us together with some unfavorable trait. At a recent gathering, I heard the speaker confidently refer to HR as the “Business Preventive Group.” What this speaker may not have realized is that whoever stood in his way probably was protecting the business. Yet, with no one willing to interrupt his speech, he continued, unaccountable for his lame attempt at humor. Health care plans are one of the biggest areas of spending and financial risks facing public and private employers, yet they’ve been placed in the hands of human resource managers. Taking care of employees is in HR’s DNA and many are very good at it. Unfortunately, this same trait makes many of them poor benefits managers, risk assessors, and financial analysts. Many just have not made the necessary decisions to maximum the quality and minimize the cost of health benefits. While the springboard (rising healthcare cost) may be unique, the accusation being levied is not new to HR. The most obvious answer is simple: Sometimes? Yes. Always? No. Our own organizations have had to face up to the hard truths. The Society of Human Resource Management (SHRM) has completed a major recalibration over the past few years in which they transitioned to competency-based certification – in part because of this perception that HR can’t break out of the status quo. They were responding to the indictment that HR was more transactional than strategic. They aimed to change the perception. The recalibration of SHRM is an affirmation that Emerick’s allegations are currently on target in some organizations. When it is accurate, it can be for one or more reasons. Many roles within HR are transactional by design. The Payroll Specialist, HRIS Manager, and Benefits Administrator may have very clearly defined transactional duties assigned to them. Innovation and strategic thinking will rightfully take a back seat. Not all HR roles are created to be strategic. The accusations against HR’s lack of strategic focus, however, don’t refer to these much-needed HR transactional roles. Rather, the charges are levied against those in leadership who are given responsibility for benefit decisions and business alignment, yet have a transactional mindset. Like the speaker mentioned in the opening, some occupants of the C-Suite have such a dim view of HR that it never occurs to them to bring HR onto the leadership team, or to empower HR to make decisions critical to the organization’s financial or business success. In these instances, HR is prevented from being strategic. The strategic HR leader rarely remains in such a situation, but seeks out new opportunities where they can apply their business acumen. The story is a common refrain. Margaret may start out as an executive assistant who migrates into bookkeeping. As she progresses in this role, she begins to take on payroll, which leads to onboarding new employees and overseeing employee benefit contributions –“qualifying” her as the in-house expert on benefits. With a small pay raise, exempt status, and a new title awarded, Margaret is now the head of HR. This common path, void of specified training, leads to transactional HR and the type of professional targeted by those who wish to demonstrate that HR lacks strategic focus. Lack of Capacity.You are more likely to find an alligator in Lake Lanier than a HR professional with a surplus of time (although it does happen occasionally). The HR professional who is pressed for time is less likely to engage in a conversation with their benefits consultant to explore the latest strategies on controlling costs. Those who have little capacity to take on one more initiative or rearrange their priorities may find themselves resting in…. One of the core values of The Benefit Company is to challenge the status quo. Though the status quo is often the familiar and most comfortable path, it can also be the costliest. Challenging the status quo requires evaluation, vetting, analytics, exposing, forecasting, and persuasion. In the benefits arena, an employee benefits consultant can greatly reduce the employer’s effort needed to successfully challenge the status quo. Still, it requires proactive, strategic effort on the part of the employer. Personal comfort or lack of professional ambition can lead to stagnation—leaving the status quo unhindered and, regrettably, affirming the argument of those who would like to dismiss HR as non-strategic. This comfort within the status quo, more than any other reason, is the driving force behind the accusations aimed at HR. Working in the employee benefits arena, I, too, know the type of changes needed to implement a multi-year benefits strategy sometimes requires leap-frogging HR. Why didn’t Chase title his book, The CHRO’s Guide…? There is a reason why he targets CEOs, and not HR, in addressing the changes needed in the practices within employee benefits. If benefit decisions are placed in the hands of a transactional HR professional, she will typically buck any initiative that unravels the annual ritual of tweaking the current health plan (accompanied by accepting a manageable rate increase). Keeping it simple is comfortable. The strategic HR professional, however, knows the value of stepping outside the “simple” box. She takes a deeper dive into analytics and tracking results. She is willing, with the help of a qualified benefits consultant, to unbundle services and providers; to put together multi-layered pharmacy contracts; and to hold vendors accountable. She continues to care for employees, but also understands the necessity of ushering them into becoming wise consumers of healthcare. Ready to leave status quo behind? If it’s time to leave status quo behind and become the strategic leader your organization needs, let us help you move to a multi-year employee benefits strategy. Contact us now at The Benefit Company at tbccontact@benefitcompany.com.